Learn to make stylish and beautiful items from leather, from homeware to fashion accessories, in your own living room. From a woven bench or log basket, to bags, a sunglasses case or even an apron, this cool craft book teaches you how to make 20 simple yet stylish leather projects. Master core craft skills that will allow you to produce elegant and durable pieces, such as hand-stitching, weaving, riveting and lacing. Learn all about working with this natural and sustainable material which has intrinsic value and gives unique character to each piece you create. Working with leather is a tidy, portable craft that requires little space and all of the tools and materials can be readily purchased - all you need is a small dining table! 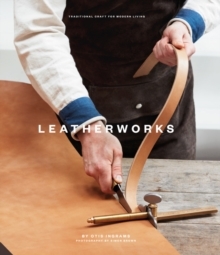 This book is the perfect introduction to working with leather.